Mr. Sanchos Cozumel is located on the south of the Cozumel Island, in average 15 minutes away from the main piers and offers a wide variety of activities so you can enjoy a full day without the need to leave the premises until you are ready to return to your cruise at the end of the day. Mr. Sancho’s Cozumel (Other common used names by travelers are: Mr. Sanchez, Mr. Santos, Santos, Mr. Santos Cozumel), is open Monday to Saturday from 8:00 am to 5:00 pm local Cozumel time, and provides a plethora of activities for Cozumel visitors to enjoy. At the exit of all Cozumel piers, there are taxi drivers awaiting for travelers to transport visitors to the different attractions in the Cozumel Island such as Mr. Sancho’s Cozumel, Playa Mia Beach Park and Chankanaab. It is safe to ride with them as all transportation is regulated by the local taxi union and prices and rules are homologated, the price to ride to Mr. Sancho’s Cozumel is in average 15 USD for every 4 passengers for a one-drive. At the end of your day, there is a taxi booth located in the parking lot, with plenty of taxis awaiting for travelers to return to the main piers. Again, the fare is 15 usd per every 4 passengers. It is advisable to book your trip prior to your visit to Cozumel as you will save 5 usd per Adult ($49.95 USD) if you book it via our partner Beach Tours Mexico (We are compensated for the following link: Mr. Sanchos Cozumel Excursions at Beach Tours Mexico). You will be offered to purchase the excursion by the taxi driver as they are also compensated for referrals, however they will offer you a price of $55.00 usd per Adult. This is by far the top selling product, not only by Mr. Sancho’s Cozumel, but overall in the Cozumel Island itself, somehow Mr. Sancho’s has been able to maintain a best in class level of service, which has positioned them as one of the top attractions in the Island. As a matter of fact, the club is very often sold out and reservations are not accepted on site in some occasions where there are several cruises in port during the day. (Another reason to book in advance here). Mr. Sancho’s Beach club, which is situated over 1500 feet south of Cozumel, as part of the Mr. Sancho’s All Inclusive Day Pass, offers a 1st classs all you can eat and all you can drink (* with some exceptions like liquour shots and foreign beers), independent beach access with beach chairs with umbrellas, romantic cabanas, fresh water showers, lockers, hammocks, swim up bars, oceanfront pools and beach palapas. It has a limit of 800 passengers per day, to ensure the right level of service to each and every customer. Natural Drinks such as Tamarind, Horchata, Hibiscus,Lemonade. The Romantic Package for 2 (Mr. Sancho’s Romantic Cabana) is important enough that needs to be discussed separately. 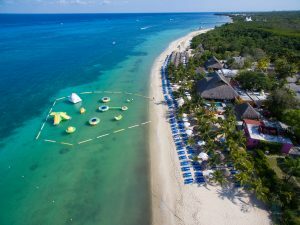 It is an upgrade to the Mr. Sancho’s All Inclusive Cozumel and includes a Cabana, and a sweedish massage for 2. 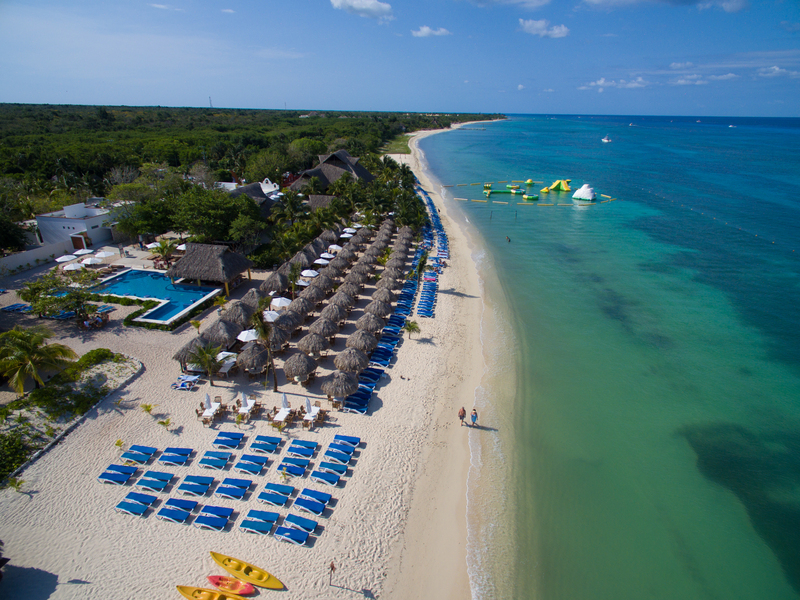 The price is $230 for 2 people and includes the All Inclusive Package. What travelers do often, when they travel in groups, is to book a Cabana and for the rest of the crew, they book the Mr. Sancho’s All Inclusive Package so they have the Cabana as a gathering point and a place to rest and have shade during the day. Do I need to reserve ahead to go to Mr. Sancho’s? Although is not required, It is strongly recommended, as there will be days where given a high number of reservatios, Mr. Sancho’s will close its doors and not accept more guests in order to ensure everybody is comfortable. What is necessary to book at Mr. Sancho’s Normally the vendors that sell Mr. Sancho’s ask for a small deposit (part of the total amount, in average $5 usd , with some exceptions like the Cabana which is $30 usd), and Mr. Sancho’s will collect the difference the day of your visit. What happens if I cannot make it or I change my mind for WHATEVER REASON? Normally vendors (Including Mr. Sancho’s itself) will refund your deposit no questions asked for whatever reason, even if you change your mind. Is Mr. Sancho’s Cozumel wheelchair accesible? It is, they also have a limited number of sand wheelchairs avaialble. Where do I pay my balance due? The day of your visit at Mr. Sancho’s they take Cash, Visa or Master Card. Will be traveling to Cozumel in January. Can you send more info and prices on booking a beach day at Mr Sanchos and other activitiesmaybe some tours available and shopping.